Ironically, the biceps constitute much less of your arms size than the bigger triceps, yet more often than not the bi’s get showered with attention and love while the tri’s are trained merely as an afterthought! So, you want huge arms? Then let us remind you of the “little-known” secret to arm development: start training your triceps like there’s no tomorrow. 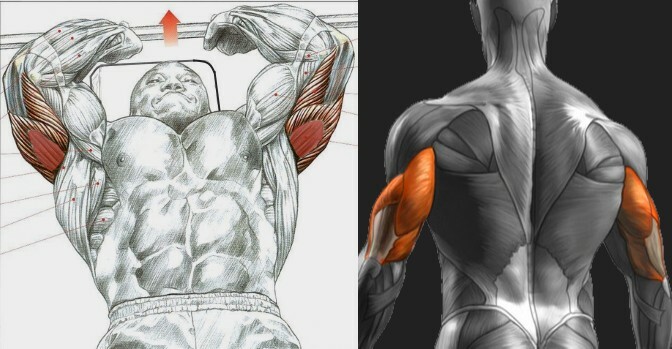 That being said, creating a highly-effective mass-building triceps workout can be a bit overwhelming, considering that even some of the most time-proven techniques for shocking the tri’s can give different results for different body types. Yet, if you get a hold of the objectively best triceps exercises, you will be on the right road to building huge, horseshoe triceps that make heads turn. And by adding a few unique twists to your regular performance, you can achieve maximum growth in just a few months, even if you belong to that notorious hard-gaining group of bodybuilders. Here’s our list of the 5 most effective triceps exercises plus a routine you can try right after reading this article! Let’s roll! Back to the basics, shall we. Seriously, if you can think of another exercises that’s a better symbol of having true arm strength and power than the parallel bar dip, go for it. In our view, all of your heavy-weight work on triceps cable press-downs is pretty much useless if you’re not able to complete one proper dip. Compound movements are what you need in order to realise your full growth potential, and there’s no arguing there. To up the intensity, use 21s for your dips. Start by taking an upright position on the dip bars, lowering your body with elbows tucked in and then performing 7 reps in the lower half portion of the range of motion. After that, complete 7 reps in the upper half portion, and then do 7 more reps with a full range of motion. 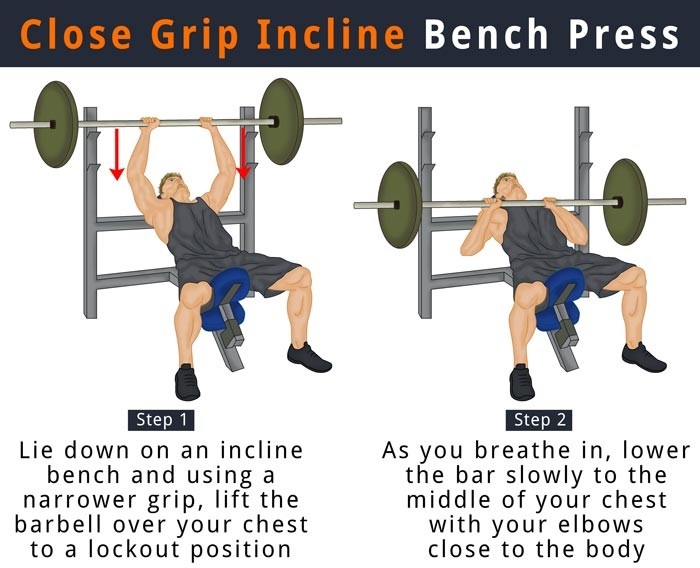 The close-grip incline bench press is another compound classic that will allow you to work tri’s with a greater range of motion compared to a close-grip flat bench press. In fact, we tend to consider this move to be the best exercise for overall triceps development there is, as it enables you to move more weight than single-joint moves and hammer your tri’s without relying on machine assistance. Just make sure not to use a grip that’s too narrow – you’d be best off placing your hands just a bit closer than shoulder-width apart. 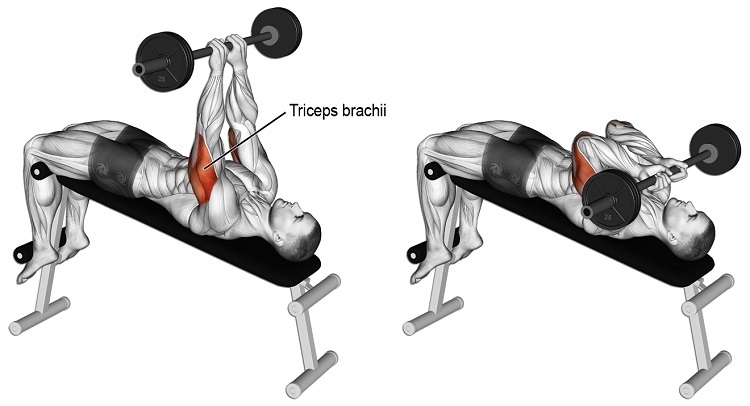 Bonus tip: try this exercise on a decline bench to get maximum contraction and even deeper triceps activation! Since this is a harder variant of the push-up, technique and form play a crucial factor for a safe and effective performance and maximum gains. If you focus on getting these two straight, you’ll end up reaping more benefits than you’ve even signed up for, including stronger triceps, stronger chest, stronger front delts and a core of steel. Unfortunately, this power move has been relatively neglected by bodybuilders, perhaps because mastering it requires a good deal of patience and discipline. But if you stick to it long enough, it will definitely pay off! Use a pair of parallel handles and place your hands close together with your forefinger and thumbs touching, then lower your body while keeping your elbows at your sides. 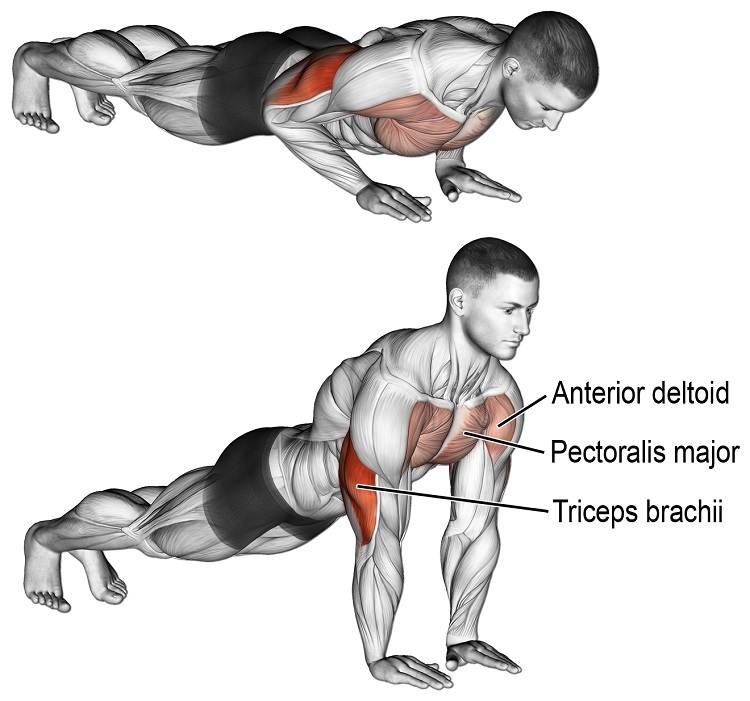 Keeping your body tense and rigid, and forming a straight line, push yourself up and emphasise the triceps contraction. When you feel like you’ve nailed down the basic diamond push-up, up your game by performing it with elevated feet in order to challenge your tri’s even harder. 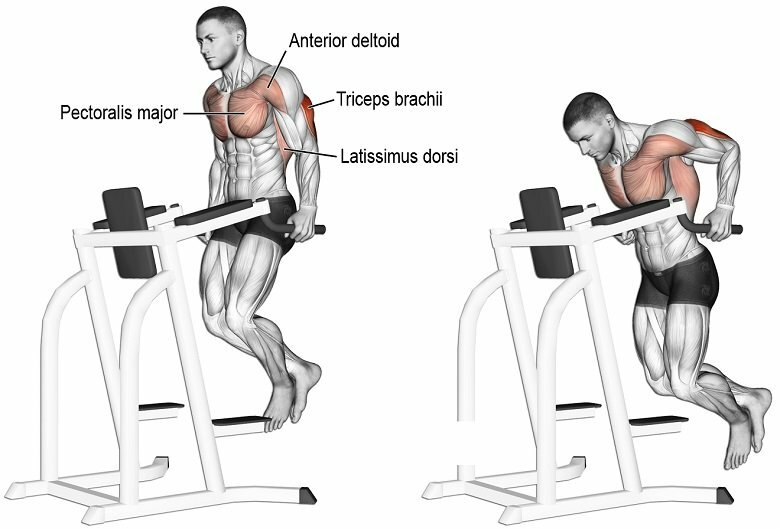 Enter the triceps rack press – a little known exercise that allows you to blast your tri’s on a unique way, while being totally adaptable to individual strength levels. Adjust a Smith machine bar/squat rack bar at waist level, and as you face the floor, grip the bar like you would for an inverted skull crusher. Maintaining a neutral back, slowly lower your body with the bar travelling toward your forehead, then press back up to the original position. 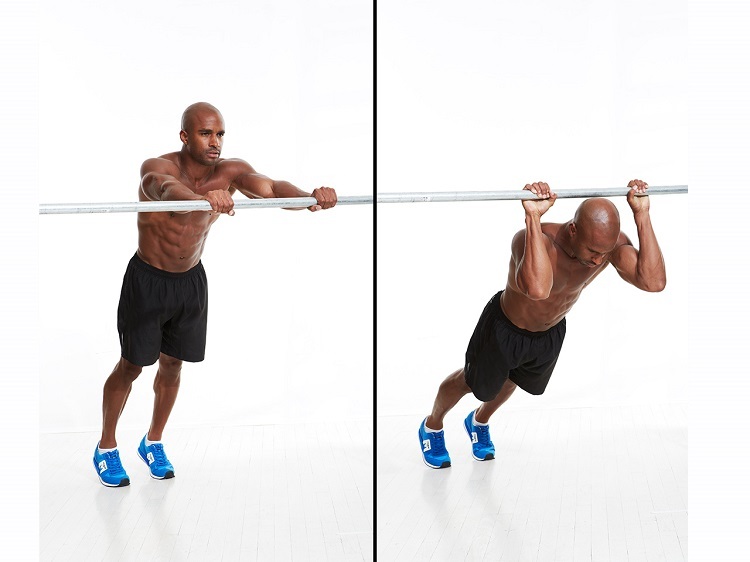 After you get good at this variant, increase the intensity by starting with the bar at knee level. Do your reps as usual, then raise the bar one level and complete another set. Keep raising the bar after every muscle failure. And that’s how you make stellar triceps gains! Skull crushers are one of the coolest moves around, and that’s not even because of their name – that’s just the tip of the iceberg when it comes to the unique ability of this exercise to make or break your physique. Namely, this is the fifth and final exercise you’ll ever need to hit your triceps as hard as possible. It can be done with many types of equipment, such as dumbbells, barbell, EZ-bar and even the cable machine, all of them providing equally amazing benefits. You can also do it with varying bench levels – incline, decline or flat bench. In other words, you can never get bored with skull crushers! Even better, they can be easily performed in a superset for some truly phenomenal gains in triceps’ strength and mass. However, you must perform them with 100% focus on form and technique – after all, it does get its name for a reason. While lying down on your back and holding a barbell over your chest (with the tightest grip possible! ), bend at the elbows and lower the bar toward your forehead. Pause for a second, then press it back up to the starting position. Now, to further isolate your triceps, you can start the exercise with your elbows back, so that the bar starts over your forehead, thus placing even more tension on the tri’s. Lower it in an arch so that it comes over and behind your head, then press it back up to the angled position.